So.... I did a thing with Ashe's cover of Let It Go and Idina Menzel... And... Here's the product! Ashe kinda sounds like Jack Frost when pitched up! okaylololnomaybenotatall BUT at least I tried making a thing... All the other Jelsa duets just had Elsa pitched down and... Well... They were in different majors... And the duets kinda sounded weird. What am I saying? My intro is too dramatic XD. Jack has his own self-choir . There are a few mistakes I couldn't fix since his cover was so different from the original, and moreover, he was singing the Demi Lovato version XDDD. You may hear some instrumental noise or weird breath marks from the singer. Just to let you know, I put effort into making this. I couldn't upload this on youtube because of copyright... And if you want this taken down, I'm really sorry that I used your work and I will do so. Copyright Disclaimer: All pictures, videos, and audio used belong to their rightful owners. perfect couple! i'm crying like a little B**** over here! That was cool I did't know I could post videos on deviantart! Who is singing Jack's part? Ashe (A SUPER AMAZING VOCALIST YESSSSSSSSSSSS) is singing Jack's part. I had to convert it to some weird file type in order to post it on here, but it worked! How did you convert it? You convert a .wmv or an .mp4 file into a .swf file. DeviantArt only accepts .swf files for some reason. How do i change it like that? Is it just an option or do i need some website or something? I've kinda gotten over being obsessed with them, but they're still one of my favorite ships. Elsa's epic hair flip........gets me everytime! Wonderful singers! The singers are quite amazing themselves. Oh, why thanks you very much! you have to see this, is sooo amasing!!! 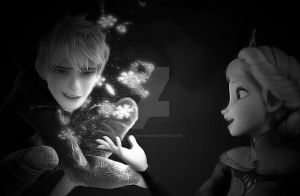 ¬¬ You know i HATE JackXElsa? Yes ;A; so cute and awesome! doe anyone agree with me? aww :I He was singing Demi's? But awesome job!